This well lies below the footpath leading from St Oswald's Church, and consists of a large cavern hewn into a sandstone-rock outcrop part of the way down the steep banks of the River Wear. It is three metres deep and one-and-a-half metres wide and high. 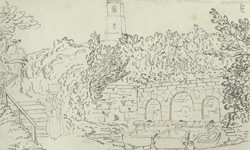 Much of the stonework seen in this drawing was destoyed by vandals in the 19th century.